Looking for tools and accessories that will help you clean your bike quickly and yet effectively? One of the most important, well-know and easiest bike maintenance trick is to keep your bike clean. Cleaning your bike can be a tedious process and that’s why bike cleaning kits are developed to help make your life easier. Here are some of the most common cleaning kits you can find today. This premium brush kit from British brand Muc-Off features 5 brushes which come in a small storage bag. A soft washing brush to clean the bike frame, a detailing brush to access dirt on hubs, spokes, and other tight parts like suspension mounts, a claw brush for chain and cassette cleaning, a wheel brush specifically designed to clean spokes and rims, and a two prong brush that reaches hard-to-remove dirt on cranks, pedals, shocks, and discs. 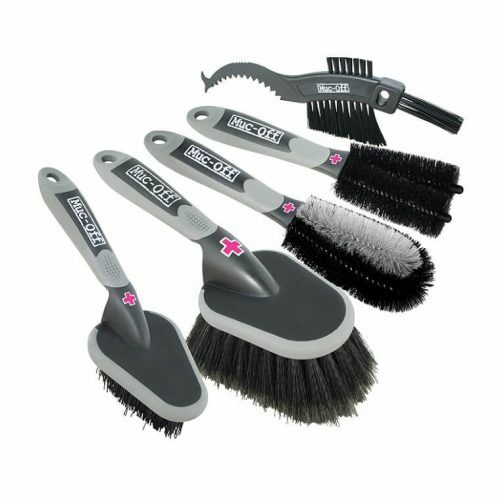 This brush kit offers great value and could also be the right gift for your cyclist friend. 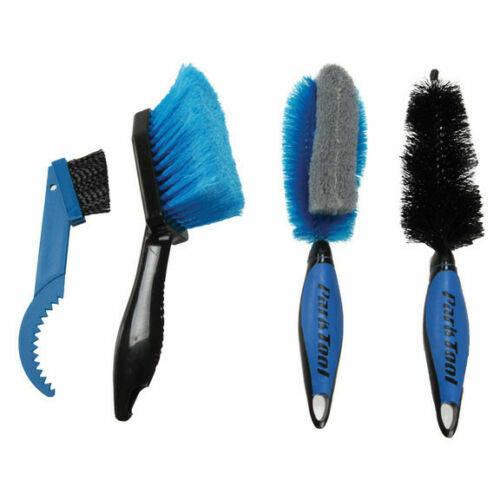 The Park Tool’s brush set will help give your bike a treat. This set comes with 4 brushes; a soft soaping brush, a frame cleaning sponge brush, a gear cleaning brush, and a tapered detailing brush. All 4 brushes come with ergonomic handles as well as dual-density grips for proper handling while cleaning. Besides, their reliable construction ensures you’ll service and maintain your bike all-year round. Every brush in this kit does its job well and cleaning your bike will always be a painless job. Whether you’re a pro bike mechanic or DIY home mechanic, this set has all the brushes that will handle every crevice. You no longer have to use an old toothbrush. This set of brushes will remove dirt, mud, and grime from your bike’s frame and other accessories. And if you own a motorbike or car, you could also use them. You don’t have to worry about misplacing these brushes since they come with a chain from which you hang them after every clean. From bike washing to traveling, and maintenance, you need to keep the chain secure and tensioned at all times so that it doesn’t come into contact with the chain stays. The Feedback Sports chain keeper does exactly that. Designed from industrial-grade CNC machined aluminum, this chain keeper works with all quick-release dropouts and a majority of 12mm axles to maintain the tension on your derailleur and chain when you remove the wheel. This chain keeper guarantees bike safety when you’re traveling or cleaning the drivetrain. 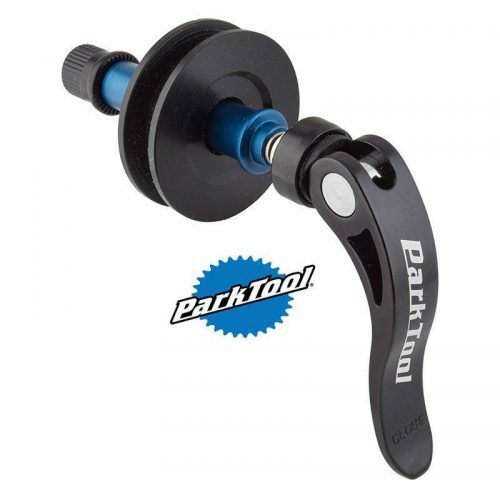 You no longer have to fumble with your chain when the rear wheel is off because the Park Tool dummy hub will conveniently replace your bike’s rear when you’re chain cleaning or transporting it. Besides, it also comes with a unique design that lets you shift your gears and blends perfectly with thru-axle frames with a 12mm width. 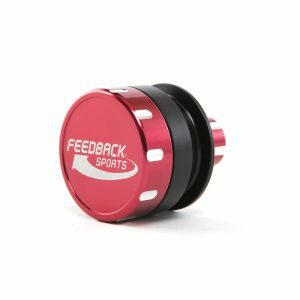 This dummy hub is a must-have if you often transport your bike with its rear wheel off. 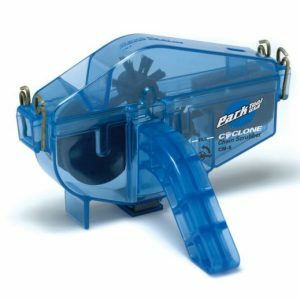 Good bike maintenance means keeping your chain clean and no tool does it better than the Park Tool chain scrubber. With several internal rotating brushes and a large solvent reservoir, this chain scrubber will get your chain sparkling in just a few minutes. It also has a magnet at the bottom of the reservoir to attract all particles and prevent them from being recycled onto the chain. A sponge material rinses the solvent of the chain to avoid too much drips. A drivetrain overhaul has never been easier and quicker with the Pedro’s Pin Peg 2 kit. This effective cleaner makes drivetrain cleaning quick, safe, and easy for everyone from the professionals to the novice. This kit comes with a derailleur hook and quick-lock closure which allows for hands-free use. With only one ounce of degreaser, your drivetrain will be spotless in minutes. This kit also comes with two items: a gear brush for degreasing your chain ring, derailleur, and cassette and a dry chain lube that creates a semi-fluid fluid which protects your chain, keeps it clean, and improves performance. This comprehensive cleaning kit will cover all angles from cleaning to protecting and lubing your bicycle. Besides, this is a rather general kit that has everything you need for road, cyclocross, MTB, and your daily commuter bikes. This cleaning kit comes with an assortment of Muc-Off brushes, a chain cleaner, microfiber cloth, bio wet and bike protect lube. It’s the all-in-one solution for those who are really particular about their bike cleanliness. When buying bike cleaning kit, many cyclists often have to choose between individual products and cleaning kits. Well, while this could be a tough decision I believe it all boils down to your cleaning needs. Whether you buy complete cleaning kits or individual items, one thing is guaranteed; you will still get the job done after all. Besides convenience, cleaning kits offer a comprehensive bike maintenance solution. BUY IF : You’re the type of cyclist who cleans your bike weekly. 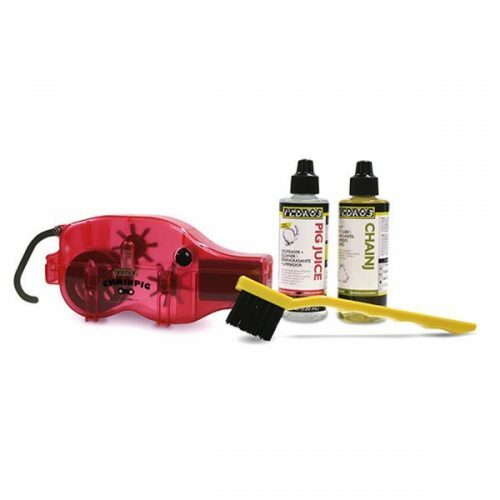 Bike cleaning kits are not for everyone as they come bundled with a lot of cleaning accessories that you might not need. The downside of this is, the cost also increases. Afterall, there’s no point buying something that you won’t use right? The most common piece of individual cleaning products are the chain degreaser, chain cleaner, bike wash and perhaps 1-2 brushes. With these on hand, it’s more than enough for most cyclists. BUY IF : You don’t need everything included in the cleaning kit or if you’re on a budget. Each kit will differ in their contents depending on who it’s targeted for, but there are some common items that are included in most bike cleaning kits available today. 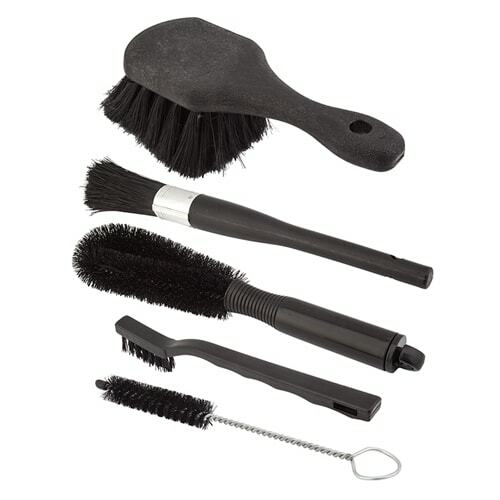 Cleaning brushes come in various size, shapes and stiffness. There’s no one do-it-all brush when it comes and hence each brush has its specific usage. Soft bristle brushes. Used to remove road grime and soft mud from the bike frame. Stiff bristle brushes. Used to remove stubborn dirt from the bike frame. Large soft-bristle brushes. Ideal for perfect for the wheels and frame. Cone shaped brushes. Used to access the difficult-to-reach parts of the bike. Chain claw. Helps you clean tight spaces between the cogs and the chain links. If you want to eliminate the brute force in breaking down grime and grease or removing the greasy crud from your cassette and drivetrain, then you should consider a chain degreaser. Degreasers are also used to clean the chain and other moving components of your bike. Failure to perform the right cleaning routine would wear your bike’s components, reduce efficiency, and affect shifting performance. When you’re shopping for a chain degreaser, be on the lookout for those marked biodegradable and non-toxic. You do not want to get your hands on corrosive chemicals that would pose a health or environmental hazard. Most of the bike washes on the market are highly concentrated and should be diluted with water before use. The bike wash is often applied and left to do its magic for several minutes before being wiped or rinsed off. Most of the grime and mud should fall off with a good wash, but brushes could come in handy should some particles fail to come off. Besides the bike wash liquid works hand in hand with a sponge and bucket. Most cleaning kits come with at least 1 sponge, or if you’re lucky, you’ll get two of different sizes. These are just standard sponges that you use to clean your car. Some brands like Finish Line package their cleaning kit into a bucket, which means that you also get the bucket when you purchase! After your bike’s free from all the grime and dirt, a final protective polish would be a good way to wrap it up. Bike polish expels water from your frame and its components, protects against corrosion, and creates a shiny finish. You need to get the right one for your bike frame finishing. With an extra layer on your bike, dirt will hardly stick and if it does, wiping it off will be easier. You can use the multi-purpose spray as a lubricant that provides a protective layer on your components. Often times, they’re waterproof as well. It can be used on most components such as the derailleurs, jockey wheels and pedals, but definitely on the brakes or chain. Lubing your chain is a must-do after every bike wash to prolong its lifespan and prevent squeaking. You can often find a small bottle of chain lube included with the kit. Sometimes, you can find a dry and wet lube included. Although this will rarely cross your mind, the truth is that your disc brakes would love a decent clean as well. Some of the grime and drip that builds up on the brake pads would be difficult to wash off with water. The right disc brake cleaning solution should also get rid of the grease without compromising on brake performance. Some brake cleaners can also rehydrate your brake pads for an extended life and less squealing.